Ann@booksonthetable wrote "Small Blessings" had the misfortune of being published on the heels of The Storied Life of A.J. Fikery". Both novels evoke serendipitous events that change the lives of good people. My staff pick this month is unconventional as we usually try to market little or unknown titles. Since my initial enthusiasm wiped out the store inventory, it no longer fits that category - but I want everyone to know what a delightful read it is. Tom Putnam has resigned himself to a quiet and half-fulfilled life. An English professor in a sleepy college town, he spends his days browsing the Shakespeare shelves at the campus bookstore, managing his department's oddball faculty, and caring for his wife Marjory, a fragile shut-in with unrelenting neuroses, a condition exacerbated by her discovery of Tom's brief affair with a visiting poetess a decade earlier. Then, one evening at the bookstore, Tom and Marjory meet Rose Callahan, the shop's charming new hire, and Marjory invites Rose to their home for dinner. Her first social interaction since her breakdown, Tom wonders if it's a sign that change is on the horizon—a feeling confirmed when he receives a letter from his former paramour, informing him he'd fathered a son who is heading Tom's way on a train. His mind races at the possibility of having a family after so many years of loneliness. And it becomes clear change is coming whether Tom's ready or not. A heartwarming story with a charmingly imperfect cast of characters to cheer for, Small Blessings's wonderfully optimistic heart reminds us that sometimes, when it feels like life has veered irrevocably off track, the track shifts in ways we never can have imagined. 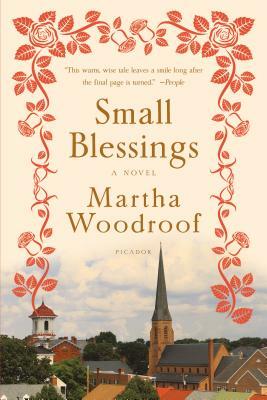 MARTHA WOODROOF was born in the South, went to boarding school and college in New England, ran away to Texas for a while, then fetched up in Virginia. She has written for NPR, npr.org, Marketplace and Weekend America, and for the Virginia Foundation for Humanities Radio Feature Bureau. Her print essays have appeared in such newspapers as the New York Times, The Washington Post, and the San Francisco Chronicle. Small Blessings is her debut novel. She lives with her husband in the Shenandoah Valley. Their closest neighbors are cows.